The Dartmouth Rugby Football Club downed the University of Pennsylvania last weekend, at Penn, by a final tally of 78-7. The match was the first of the Ivy season for the DRFC, which also notched a 38-7 victory in a B-side match played later that day. The next day saw Dartmouth in Princeton, New Jersey, rolling over the Tigers 52-3 amidst strong play by back Will Lehmann ’12 and DRFC co-captain Tommy Brothers ’11. This past Saturday, Dartmouth took the pitch in New Haven, set to play the Bulldogs at Yale. Match reports aren’t yet in but Yale came into the came with a 2-0 record, similar to Dartmouth’s, after downing Ivy rivals Columbia and Cornell. Details forthcoming. With the recent advent of collegiate rugby’s fall season, campus pitches across the country are once again alive with rucks, mauls, and scrums. One of the more lively is Sachem Field in Hanover, New Hampshire, home pitch to defending Ivy League title-holders the Dartmouth Rugby Football Club. Fresh off a first-place finish in New England’s pre-season Granite Cup, an invitational tournament of squads from New Hampshire, Vermont, and Canada, Dartmouth opened its regular season this weekend with two matches against Columbia University, at Columbia. It won both by considerable margins, notching an 80-0 shutout in the second. 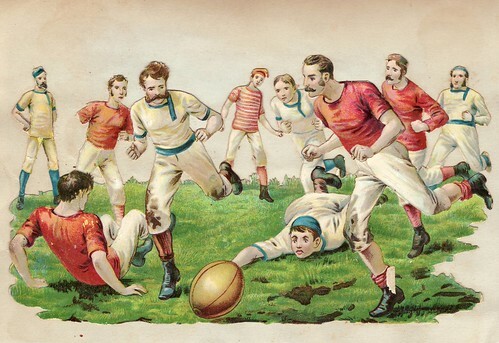 The Dartmouth Rugby Football Club. The DRFC is set to play its first home match against Yale University Saturday, September 26. This weekend’s wins make Dartmouth 2-0 in regular season play, outscoring opponents by a total of 171-3. Dartmouth has won eight of the last 11 Ivy League championships and has won 13 New England championships and appeared in 12 national championships. It is the oldest continuously-touring collegiate rugby program in America.